It is no wonder that the word ‘infertility’ often conjures up images of sadness, emptiness and loneliness. Gilly-Elle Wiltshire, Children’s author, proud mum of an IVF miracle, infertility advocate, too many passions to name! It is no wonder that the word ‘infertility’ often conjures up images of sadness, emptiness and loneliness. Infertility is extremely painful. You feel as though there is a dark hopelessness hanging over your life and it affects you every single day. Simple things such as seeing a baby in the street or hearing a child laugh can reduce you to total devastation. Don’t even get me started on pregnancy announcements! However, there are some positives that come along with it. Obviously if you have successful treatment and you are blessed with a baby, this is the absolute. Everything you were dreaming of, fearing would never happen and spent so many years in distress for has eventuated in a little miracle and you are at last a parent. There are absolutely no words to describe how overwhelmingly special this is. Many people have found the social media explosion helpful for their infertility journey. Support groups have become a staple for people in their everyday lives to get advice, support and friendship. In any aspect of life sharing a special bond with those going through similar experiences is comforting and empowering and I have seen many strong, lifelong friendships blossom in these infertility groups. My own infertility journey had a positive outcome that I would have never imagined. My daughter was born in 2015 and is my absolute world. She inspires me every single day and I am blessed beyond belief to have her in my life. Inspiration occurred when she was a few months old; during arduous and painful feeding sessions (due to severe reflux and tongue tie) I began to think of ideas for children’s stories. I started to write them down but did not think anything of them, until one night I thought about how I would explain the journey to my daughter of how she came to be in the world. At 3am I jumped out of bed and sat on the toilet floor and wrote as words tumbled into my head. I completed the story within an hour and went to sleep. The next day I read it to my family and their reaction of tears showed me that this was actually quite special. I researched the market and was surprised at the lack of options available for parents. 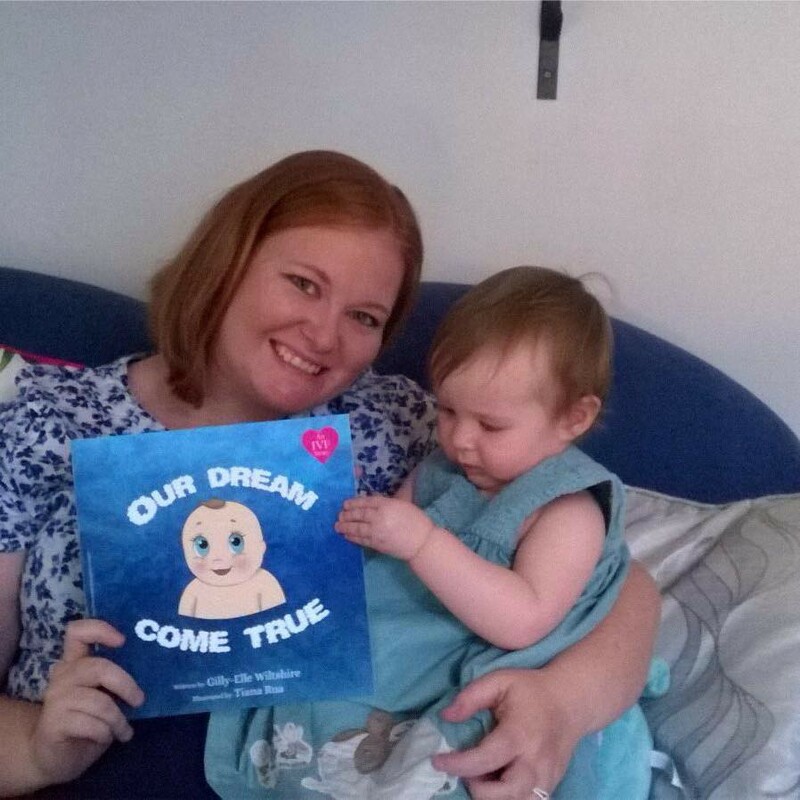 My book, called ‘Our Dream Come True’ is unique in nature, as it is written in rhyme and focuses on love rather than technical language. Self publishing my book seemed like a great idea and I managed to learn a whole host of new skills in order to bring it to fruition. It was published last year and has had some fantastic reviews and positive impacts for families. My second book is available very soon and is a beautiful recollection of special moments throughout pregnancy and early motherhood, again reinforcing to children how loved they are. Although being an author has always been a dream of mine, I honestly do not think I would have made the leap if I had not written ‘Our Dream Come True’. I have turned the pain of my infertility journey and the love for my daughter into something special and I am very proud of that. For National Infertility Awareness Week I am happy to offer a discount of 18% as I am very proud to be 1 in 8 people that need fertility treatment. If you wish to take advantage of this enter the coupon code 1IN8 at my website www.gillyelle.com.